← Day 30: Try Yin Yoga. Old McDonald had a farm… but then he sold it to real estate developers and moved into a shoebox in the city, and was surprised when he couldn’t get his tractor to help him sow fields of organic produce on his balcony. 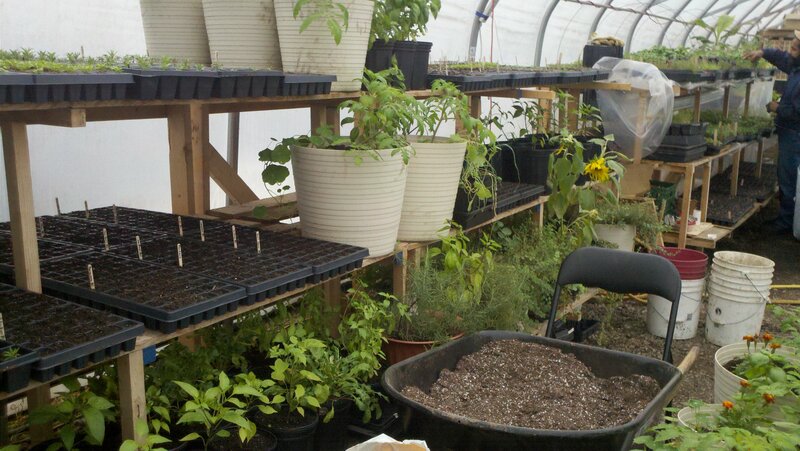 So he called me, the voucher queen, and I took him to an Organic City Farming and Gardening Workshop at Fresh City Farms, where they got us both sorted by teaching us the basics of how to grow stuff in the city, including container gardening. But when he found out that Fresh City Farms also offers anybody the option of receiving their very own box of locally grown (wherever possible) organic produce on either a weekly or bi-weekly basis, delivered to a convenient spot in your neighbourhood, well, he signed up, because after all, he is Old, and that is just way too convenient, and now he never has to miss another episode of Coronation Street ever again. I love meeting people who are passionate about what they do, and Philip, Jessica and Luis definitely fall into that category. 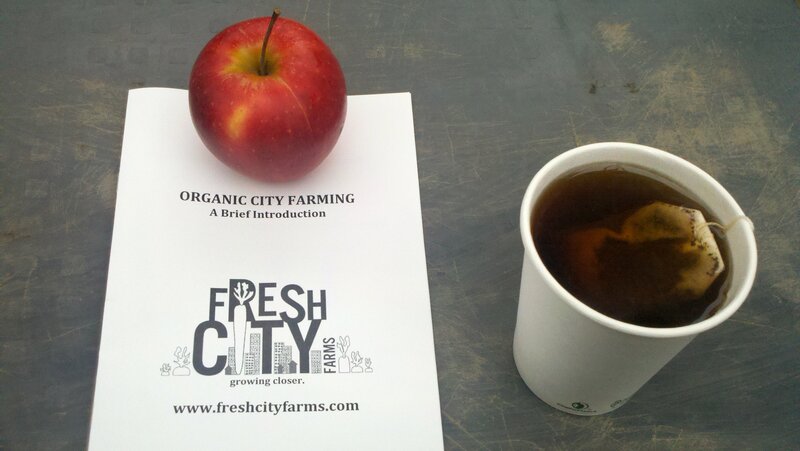 The session started with a little tea, fresh, organic apples and homemade oatmeal cookies while Philip gave us a brief history of the young initiative, nestled in a Fresh City Farms greenhouse in one corner of Downsview Park. Jess then took over the reins, and effervesced about the importance of getting your soil full of life and the wonders of worms. She also reassured us that, even though many of us may have had blackish thumbs in the past (or in my case, the ever present), ‘gardening makes the gardener’, and we were already taking a big step in the right direction to find our inner nurturer of all things green just by showing up today. We broke up the morning’s workshop held on crates in a magnificently warm greenhouse with mini field trips right outside to learn how to identify different types of soil, and investigate the bio-diversity hiding in one square foot. Our team of four found the most – about 20 or so earthworms – which may sound like a lot, but the optimal number is actually closer to 30! Who knew?!! It’s still early in the season though (it’s March for chrissake!! ), so this will undoubtedly improve over the coming weeks. Jess then also explained how to build a composter, and, even better for those of us without the luxury of a sprawling yard, a vermicomposter (think of it as adopting worms as pets; if you do it right, they will eat the food scraps you feed them, and it won’t smell at all, and you’ll be left with lovely soil for planting all kinds of delicious treats in containers on your balcony). We also discussed the importance of ground cover, and even something called lasagne mulching (true story!). Great… now I’m hungry. Luis, an intern, who spent a lot of time in El Salvador consulting with different organic farmers on how to improve their bounties, then brought us through such delicate topics as watering, inter-cropping, transplanting, and mixing soil. He also waxed philosophical about perennials (where you plant stuff once, and it comes back year after year – now that’s my kind of gardening! ), and rotating where you grow things. We also learned how combining certain plants together in the same container can deter pests, while subtly enhancing the flavour of the vegetables themselves. 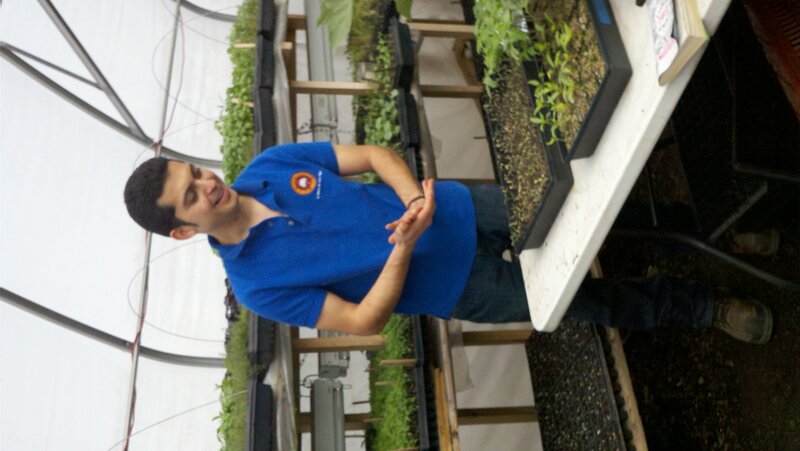 A popular pot combo is basil, tomatoes and marigold, for instance. Hmm… That might just be doable. Basically, I no longer have an excuse for murdering countless innocent plants and herbs. We got to see the process for starting seedlings indoors, and then helped to transfer a few of them to slightly larger containers. 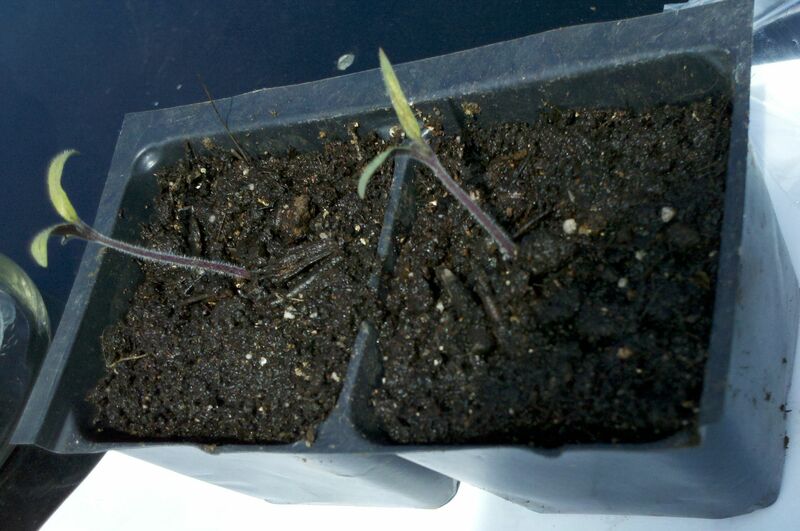 For our efforts, we were rewarded with a couple of little tomato seedlings to take home (poor unsuspecting buggers… I named mine Bert and Ernie). The nice folks also gave us a little baggie full of seeds to take away to get us started. Bless. This entry was posted in Educational and tagged city farming, deal, Fresh City Farms, gardening, March, organic, produce, seed starter kit, vegetables, voucher, workshop. Bookmark the permalink. 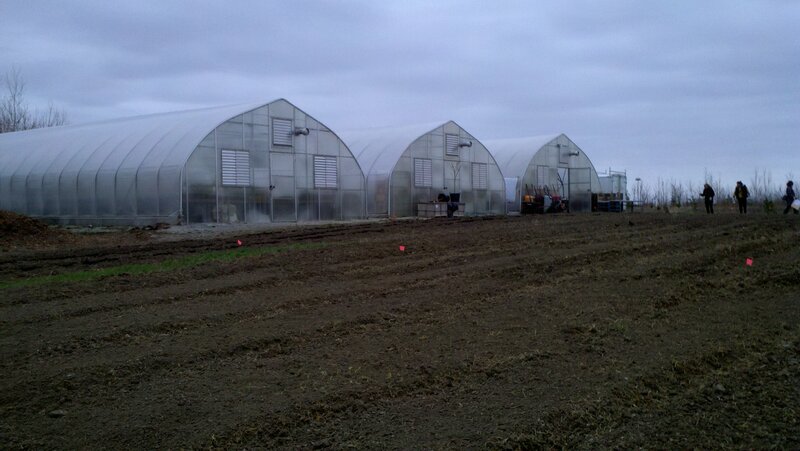 1 Response to Day 31: City Farming Workshop.